Buffet restaurant at Sofitel Ambassador Seoul, King's welcomes the new autumn 2006 and introduces new dishes including popular Mongolian BBQ. Mongolian BBQ finds its origin from the wartime where soldiers used steel shields to bake meat and vegetables to fill protein. At King's, guests can make their own dish with their choice of ingredients to be cooked by the chef. The restaurant also adds more fresh seafood dishes besides Mongolian BBQ. 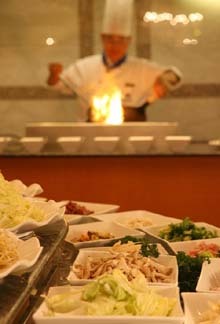 Join at King's now and enjoy newly introduced Mongolian BBQ and other new fresh dishes.